Summer and icy-cold desserts are synonymous. Ice cream of course, but the humble snow cone reminds me the most of summer. I'll eat ice cream year-round, and while there's nothing wrong with eating a snow cone in January, it's not my first thought. Plus, I'll also always remember my brother and I selling snow cones at our neighborhood garage sales growing up. Yes, our uncle let us borrow his OLD snow cone machine, and we bought syrup from goodness only knows where - I was like 6-years-old so I don't remember! 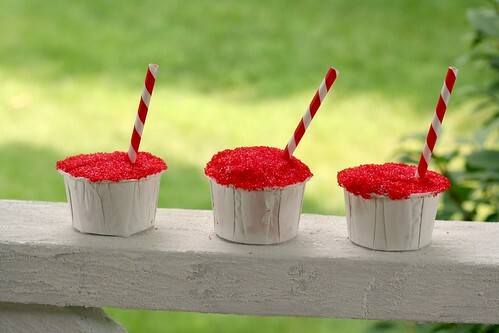 Craving snow cones, and trying to come up with a cute way to decorate cupcakes for 4th of July, I put the two together. As much as I wanted a snow cone, they're not the easiest to make and transport for 50+ people. But, I figured the dome top of a cupcake was similar to the top of a scoop of shaved ice, so why couldn't a cupcake look like a snow cone?! How perfect are these for any summer occasion? Like 4th of July, birthdays, Labor Day, or even Tuesday! Below is just a method - you can definitely use whatever recipes you want. I used yellow cake and a basic vanilla buttercream, but imagine fun fruity flavors like you'd find in snow cones?! Using an off-set spatula, frost the top of each cupcake, covering the entire top. Put sugar sprinkles in a wide shallow bowl, on a plate or whatever is most accessible. Dip frosted top of the cupcake in the sugar sprinkles, twirling to ensure the entire top is covered. - You can use whatever flavor combination you want, but I would recommend white/lighter colored frosting, so that the sugar sprinkles really pop. Or, the same color as the sprinkles. You can tint any frosting using gel colors without affecting the consistency of the frosting. - If you plan on putting the cupcakes in cups, make sure to double check how it fits before decorating. For these, the cupcakes fit perfectly in the cups with a little push down, so I actually had to put in the cups before decorating so I wouldn't have to push down on the final cupcake. I hope you don't think this a spamy, but I couldn't find your email anywhere. I wanted to make sure that knew about Food Media Forum (it's in St. Louis Aug. 9-11). I think you'd love it and I'd love to meet a fellow cupcake baker. You can find all of the info on our website (http://www.foodmediaforum.com) and feel free to shoot me an email if you have any questions. Cheer! Thanks Stef-- I love love LOVE your blog!! And that's not spamy at all! I was actually considering going, would be my first food blog conference, but I realized I actually have plans that weekend and can't go. It sounds like it will be a great event :). And ill definitely be keeping an eye open for any upcoming St. Louis area food/blogger events!